This is the original Live Path Experience Architect 2005-2012 archive. Visit the main site for more recent posts and information! On this blog, we often talk about how little things can shape your experience....and the truth is, there are some things that may annoy us that aren't going to change. I'm in the store, in the checkout line. The checker finishes swiping my merchandise and I hand her cash to pay for the bill. I am getting something like $8.59 back -- four bills and a chunk of change. The cashier extracts the bills and shuffles them to her left hand. She then pulls out the coins with her right hand. Turning to me, she then piles the coinage on top of the stack of bills and attempts to hand me this awkward pile of cash. Man, I just I hate this! Now, maybe I'm just (a little, tiny bit) obsessive -- or maybeit's because I'm a girl. If I were a guy, I'd probably just take the wad of cash and shove it in my pocket. But, since I'm a girl - and like most girls - I'm usually standing there with one hand out, and my wallet open in the other, ready to put the bills in. Eyeing the awkward pile-o-cash, I must juggle my wallet between my forearm and my body so I can reach out with both hands for the cash without upsetting the vicarious pile of coins. I then use both hands to sort off the change so I can get the bills and the change into their respective compartments in my wallet. Add in the receipt and/or the six feet of coupons the checkers often hand back to me at the grocery store and this is a pain! A momentary pain - and a small annoyance, no doubt. However, sometimes, as I roll out to my car I can't help but think: "It's really an extra step to pile up the cash in one hand like that! Why not just hand over the bills first, and then the coinage? 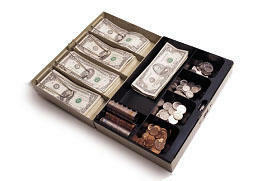 Does someone at cashier school teach people to pile up the change like that?" It's sick, I tell you, sick!!! So, now that you're all convinced I'm a lunatic, I will stop ranting about something that is, in the end, not really "change worthy." Don't worry: I won't be starting a campaign to retrain all the checkers. The fact is, we all have petty peves we may walk along unaware of until the moment they strike. My question is: What's yours? You know, up until yesterday, I was thinking that I'd like to do a piece on JetBlue experience. I like the service, blue snacks, comfy seats, low prices, and satellite TV..... but here is an experience I could live without! LOS ANGELES (AP) The airliner circled Southern California for hours, crippled by a faulty landing gear, while inside its cabin 140 passengers watched their own life-and-death drama unfolding on live television. 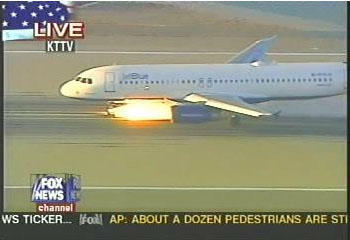 While satellite TV sets aboard JetBlue Flight 292 were tuned to news broadcasts, some passengers cried. Others tried to telephone relatives and one woman sent a text message to her mother in Florida attempting to comfort her in the event she died. 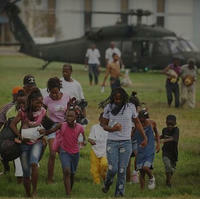 For the past two weeks I have been immersed in a Katrina relief effort. I have had the honor of meeting several individuals whose lives were swept away by Hurricane Katrina. I'm not sure many of us have ever had to live through a castrophic experience like the citizens of the Gulf coast. Nothing I've experienced can touch it, and my heart aches for the thousands of displaced people. Ironically, I've found that the more I give of myself, the richer I feel. How's that for an experience paradigm? Not sure how many of you have donated money to the Red Cross, Habitat for Humanity, the Salvation Army or any of the dozens of other charities out there, but please give generously. If you can, find a charity with matching grants, so your dollars will stretch even farther. Do this, and I guarantee you'll find what I have discovered the past few weeks: The more you give to others, the richer you become, and the more in touch you get with yourself at your best. Click here for a gripping video on Katrina relief (turn up your volume) created by Gary Sloate and a list of charities that support Hurricane Katrina victims. Let's face it - we're all sweating a little: Product and service commoditization are forcing strong price competition - squeezing margins and motivating us to tigthen our belts. In the midst of "the squeeze", it's harder than ever before to deliver increased value to customers and build differentiating customer experiences. We often have fewer resources to draw upon, and we want to be wise about how we invest them. The sinker balances the delivery of these elements effectively – in and across a variety of media and channels. Without the basics, investment in innovation is the equivilant of putting lipstick on a pig: You're not fooling anyone. It takes discipline, focus and dedication deliver one thing better than anyone else. As a litmus test, try to articulate what you deliver - in three words or less. --> Personal engagement is key - click, call and walk-in on a regular basis! Reinforcing this with effective marketing and branding results in the creation of legitimately humanized brands that connect with their target markets in more memorable and personable ways: Think Apple; Nike; You? Deliver the foundational elements well, and the rest will be icing on your very appealing cake: You'll develop a new understanding, appreciation and passion for customers; attract better employees because of your authentic focus on the things people most care about; and your influx of innovative ideas will become more relevant, actionable and customer-centric. 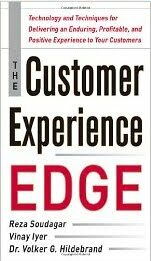 Experience Leaders never forget that beyond bells and whistles, it's the cumulative experience that people remember. Making sure innovation is delivered from a foundation of excellence will help ensure innovatiion dollars do not go to waste. This is how experience leaders are creating brand equity, today: You can do it, too. Couches, Climbing & Coffee...Oh My! Best Buy utilizes state-of-the-art technology to integrate direct marketing, web and retail experiences. In addition, stores have begun to utilize detailed profiling to adjust each store's product mix, merchandising and treatment of customers -- an approach that drove sales up in the company's San Jose store by 30% in the first year. There was a great article about this in last week's Washington Post. In addition to making the retail environments more experiential, the company is also investing in new products and services related to the entertainment and electronics field: They recently purchased "Geek Squad," a Minneapolis-based company which manages product warranties and offers door-to-door technical support from qualified "geeks" who drive branded VW Bugs, carry badges and a sense of humor. In addition, the store's new "Magnolia" service offers high end audio and video systems and installation. Specially trained Magnolia agents help consumers sample and purchase multi-component systems in plush, specially designed viewing rooms within Best Buy stores. The results? The competition is scrambling to catch up, and Best Buy is successfully grabbing customer affinity and market share. REI is well recognized, both for its incredible array of outdoor and recreational products and its fully integrated online and offline experience. The retailer offers more than 94,000 individual items (7000 products) on a robust commerce platform that is fully integrated with REI's web, retail stores, call center and direct mail operations. The fully integrated platform allows REI to capture a single view of customer interaction across channels, as well as programs that reward repeat purchasing and customer loyalty. The system also hosts a knowledge base, replete with more than 5,000 pages of product information accessible by curious online customers as well as REI's staff of passionate outdoor enthusiasts. The brick and mortar retail environments are crafted to reflect an outdoor vibe, and even offer climbing walls for customers to try out. REI retail sales associates are happy to help store patrons locate - try on, try out and even rent - gear to suit their their needs. When customers are ready to venture out, REI offers maps, books, message boards and web-based directories that help patrons plug in to the local scene with local excursions and an array of hiking, biking, skiing (etc.) clubs. When customers are ready to go farther, "REI Adventures" offer special excursions that can take customers to almost any corner of the world. ING Financial Services recently opened, and are now expanding innovative ING Direct cafes in New York, Los Angeles and Philadelphia. These funky, hip locations offer a great cup Peet's coffee along with comfortable seating, free high speed internet access and flat screen televisions broadcasting the latest financial news. They also offer banking and ATM access, in addition to free financial seminars and events. ING Direct cafes are a comfortable place to work remotely, conduct an informal meeting or meet up with a friend -- and as ING has discovered, a great way to build brand affinity and pick up new clients. It's a new spin on banking - and your morning cup of coffee. Delivering old products in innovative, new, and integrated ways is working for these companies, and it can work for you, too. Long term success, however, also requires these innovators to master "old school" delivery as well. One thing these companies have in common is that they are also skilled in the delivery of what I call "the fundamentals of experience." I'll write more about this in my next post. Shoe Carnival: Watch Out for Carnies! I’m Leigh Durst, a 20 year veteran in business, operations, customer strategy, ecommerce, digital & social media and marketing. Simply put, I’m a strategist that helps companies (start-up to blue chip) achieve business shift, create more compelling online and offline experiences. I also write, speak and teach about experience design and next-generation business. I’m a futurist, visionary, strategist, doer and connector with a passion for people and helping others. When I’m not on the road, you’ll find me in the San Francisco bay area, working, beaching it and hanging out with my family and dog. Age of Conversation 3 - Get yours now in hardcover, paperback and for the Kindle.